What this quick start guide isn’t? It is not a discussion of open v. proprietary system. Our facilitator group was aware of the lack of openness and of the privacy concerns that a G+ Community software represents. We made the choice that it was a necessary compromise for the larger goal of implementing the connected learning values and principles. You may make other choices. If so, let me know about them because I am trying to find those myself so that I can make my community choices align better with principles of openness and privacy that are inherent in connected learning. Until then….G+ Communities it is. I also recommend that you join the G+Community Quick Start Group on Diigo for continuing updates and bookmarks from other resources. Here is Martin Shervington’s all-encompassing (yes, I do love Mitch Hedberg) Google + users guide as well. 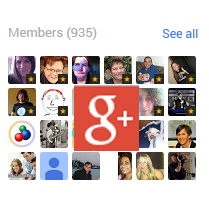 G+ Communities might be thought of as the visual descendant of the Google Forums and Groups. I think of them as much warmer and more congenial environments than that. What follows are screencasts that outline discrete steps to getting your G+ Community up and running. I have not created these, but I plan on following up with specific ones that outline what we did in #clmooc on our G+Community page. Once you have the G+ community and you have invited folks to come you might want to return to your original motivation in creating the community in the first place. That will dictate your use of the ‘sticky’ elements at the top of the Community space–the ‘about’ space and the related links. Perhaps the most important part of your G+ community is fostering the community activities. This can be done by assembling a good group of people there, starting compelling discussion threads, and most of all, keeping the conversations going. Seeking and developing others to co-facilitate your community is also helpful. It may take some thoughtful care and feeding, but once your community reaches a critical mass, you may see some amazing collaborations happen.